add a touch of warm soft lighting giving you that “outdoor feel”. 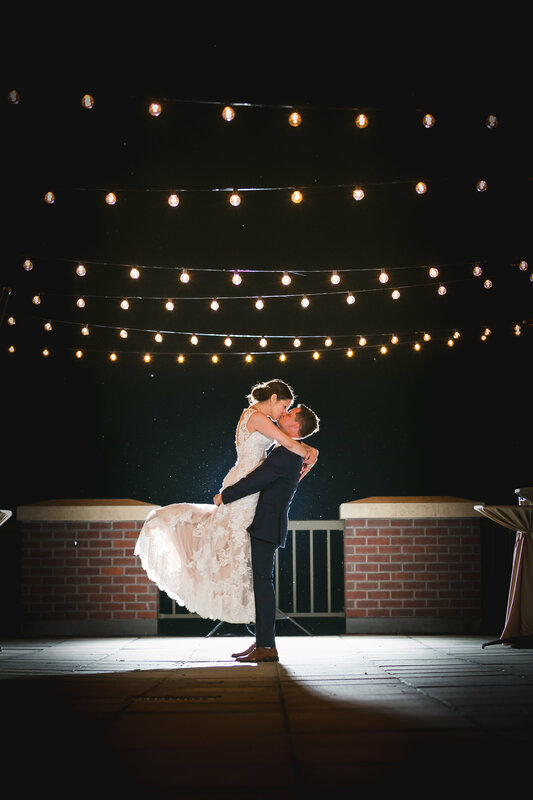 String lights emit a classic look and work especially well in rustic settings such as barns, inside an old mill, warehouse spaces, a natural environment and tents. Consider using string lights around the perimeter of a tent, or your outdoor trees as an additional source of general lighting. Our String lighting strands come in black or white wire to fit your theme. Most bulbs are about 2” diameter, golf ball size. We are Wisconsin’s String Lighting & Café lighting pros since 2008. We work closely with you to create a look your guests will “WOW” over. Placing the strings of lights among your trees or stringing them over your deck or patio creates a romantic ambiance that harkens back to a more carefree era. Have You Felt the Ambiance of Outdoor String Lighting? We have heard that some people try to install their own outdoor or tent lighting. This task can be a lot of work, with ladders, electrical, and keeping your overhead rigging safe. Dream Lighting Company has been installing these lights for over 11 years. From all kinds of back yards to social event spaces, restaurants, and weddings. Outdoor lighting, café lighting or market lighting—however you refer to it at your establishment—can increase traffic as passing diners are pulled in by the emotional warmth these lights create. Whether you’re building an atmosphere of nostalgia, outdoor feel or a festivity, string lighting is a worthwhile investment. If you’re interested lighting an event space, contact Dream Lighting Company today.